Scientists have developed a highly porous ceramic foam ink containing a mixture of alumina particles, water and air that can be patterned in 3D to design constructs similar to natural structures and which possess superior mechanical properties. 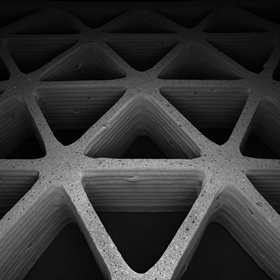 The new approach to 3D printing materials with independently tunable macro-and microscale porosity ensures greater control of the structure of 3D printed materials, and is suited to applications that need closed or open cell foams, such as lightweight structural materials, thermal insulators, catalyst supports, tissue scaffolds, electrodes and porous filters. The team, from the Harvard School of Engineering and Applied Sciences, the Wyss Institute for Biologically Inspired Engineering at Harvard University and MIT, explore additive manufacturing, making them suited to producing engineered structures composed of multi-scale architectures. In this research, to be published in the journal PNAS, they were inspired by the superior mechanical properties of grass and other plant stems, which can support their own weight as well as resist strong wind and be able to recover after compression. These mechanical properties arise from its hollow, tubular macrostructure and porous microstructure. In this study, they demonstrated direct foam writing of a lightweight hexagonal honeycomb with tunable geometry, density and stiffness. Once the ink solidifies, the structure consists of air surrounded by ceramic on multiple length scales, with the porosity of the structure having an effect on the structure's properties. Controlling the foam’s microstructure meant they could tune the properties of the ink and how it was deformed on the microscale. The team are now looking to extend their research by creating new foam inks for patterning hierarchical open cell structures, and also by demonstrating the versatility of the ink design by using this approach to print metal, polymer, and other ceramic foams. As researcher Joseph Muth points out, “We can now make multifunctional materials in which many different material properties, including mechanical, thermal, and transport characteristics, can be optimized within a structure that is printed in a single step”.